FYI...Tugging at the lashes will damage them so steam and detailed removal work is necessary to make sure that little or no damage is done to the natural lash. These are a set of competitors lashes the extensions are clumpy and attached to multiple lashes causing damage to natural lashes!!!! Posh was able to detach the harmful extensions, saving the natural lash from damage. and was able to correct the set, with a lash rehab and fill in!!! Posh will Carefully remove any extensions that are half attached and may be causing a discomfort by poking you. Posh will put our best effort into UN-globing the remaining lashes from excessive glue use. Because different glue is being used out in the world it has taken up to 1 1/2 hrs. to dissolve a competitors nail glue before... (ugh .. Scary) FYI...tugging at the lashes will damage them so steam and detailed removal work is necessary to make sure that little or no damage is done to the natural lash. Local $60 set of "lash extensions"
Amplifeye® Lash, Brow & Hair Formula - Represents a breakthrough in targeted nutrition for lashes, brows, and hair. This advanced daily supplement regimen contains key nutrients including essential fatty acids, vitamins, minerals, and antioxidant botanicals. 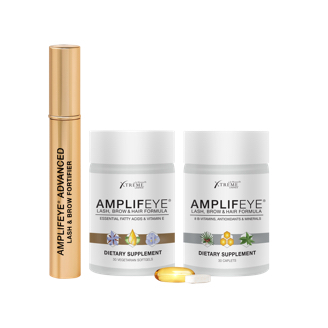 Scientifically formulated, this supplement has been designed for use in conjunction with daily topical application of Amplifeye® Advanced Lash & Brow Fortifier - both sharing ingredients including green tea, saw palmetto, borage, ginseng, evening primrose, and rosemary.